Copper Leaf is made from 99.9% copper. Copper Leaf is thicker than genuine gold and silver leaf, and can be gently handled with clean, dry and oil-free, hands. 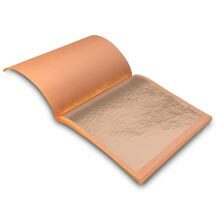 Copper Leaf is available in both loose and transfer/patent leaf, and is also available in rolls. The leaves are 6-1/4” square and are packaged in books of 25 leaves. To maintain its color, copper leaf must be sealed after being applied, or it will slowly tarnish. Copper leaf can also be intentionally tarnished, or antiqued, using common household chemicals, which can change its color to give it an aged appearance.